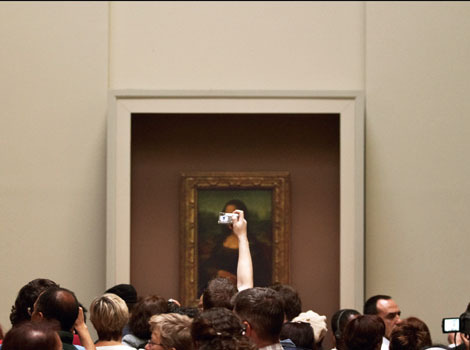 Tourists flock to view the Mona Lisa painting by Leonardo da Vinci which hangs in the Louvre art gallery in Paris, France. This site contains copyrighted material the use of which has not always been specifically authorized by the copyright owner. We are making such material available in our efforts to advance understanding of environmental, political, human rights, economic, democracy, scientific, spiritual, and social justice issues, etc. We believe this constitutes a FAIR USE of any such copyrighted material as provided for in section 107 of the US Copyright Law. In accordance with Title 17 U.S.C. Section 107, the material on this site is distributed without profit to those who have expressed a prior interest in receiving the included information for research and educational purposes. For more information go to: http://www.law.cornell.edu/uscode/17/107.html. If you wish to use copyrighted material from this site for purposes of your own that go beyond fair use you must obtain permission from the copyright owner. So, let’s understand the concept: If use of someone else’s work includes any commercial or financial benefit accruing to you, you are violating copyright! (Please note that my blog allows no advertising whatsoever — it costs me to host this blog, but earns me nothing.) Nobody has hired me, or otherwise induced me to write reviews, mention products or services, or to alert readers of coming events. CONCLUSION: Don’t re-use another’s writing, artwork, photos, unless your re-use conforms to the purity and spirit of FAIR USE.